Strength of the wall of artery gradually deteriorates with age. Inflammation that is associated with atherosclerosis accelerates this degenerative process. Aneurysm results from ballooning out of a weakened artery by the pressure of the blood inside. Aneurysm will grow and eventually burst if it is not treated. 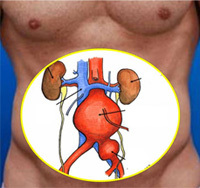 The main artery in the tummy (i.e aorta) is most commonly affected (Abdominal Aortic Aneurysm AAA). The normal aorta is about 16-22mm in diameter. When it is enlarged to one and a half the normal size (about 3cm) it becomes an aneurysm. Who are at risk for developing an aneurysm? Aneurysm runs in family and is associated with history of heart disease or peripheral arterial disease. Risk of AAA increases with age and are between five to ten times more common in men than in women. Smokers are eight times more likely to be affected. Most of these patients are therefore male smoker over the age of 65 years, particularly those with sibling having history of aneurysm. Most have no symptoms, for those at risk, it is important for them to screen for it. Some may aware of a feeling of pulsation in the abdomen. On rare occasions, a mass can be visible. As the aneurysm stretches, it may cause back pain. An aneurysm may be detected when doctor examines the abdomen, but many cannot be felt. In fact, seventy-five percent of the aneurysms that are discovered are detected from diagnostic tests (such as x-rays or scan) that were performed for other health problem. If an aneurysm is suspected an ultrasound examination will find out if there is an aneurysm and exactly how large it is. When aortic aneurysms are diagnosed, early treatment is safe and effective. The devastating and mostly fatal consequence of a rupture aneurysm is avoidable. The risk of bursting increases as the aneurysm get bigger. When it ruptures the overall chance of survival is only 2 in 10. Once repaired, the risk of rupture disappears. Not all aneurysms need an operation. Operation is advised when the threat of bursting is greater than the risk of operation. Operation carries risk, the exact size at which operation will be advised also depends on the health status of the patient. In general, if the aneurysm is more than 55mm in diameter, it is safer to have an operation than to leave it alone. Size of smaller aneurysm which has no symptom is better monitored by ultrasound scans. How does the aneurysm be replaced? 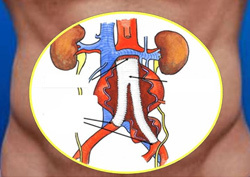 The tummy is opened, the enlarged segment of aorta will be replaced by an artificial blood vessel (graft) made of Dacron .This permanent graft is sewn in place and the aneurysm sac is closed over the graft to separate it from the overlying structures. 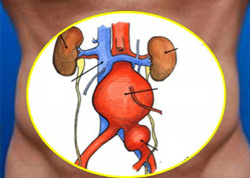 Aneurysm may also be treated by a new method (Endovascular Stenting). A graft is implanted through the lumen of the aneurysm by inserting a tube (with a collapsed graft inside) into the artery at the groin. X-ray guidance is used to accurately position the graft in the aneurysm. 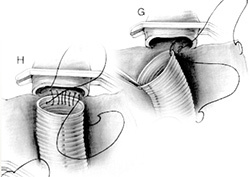 The graft is then released inside theaorta which is held in place with metallic hooks rather than sutures. Endovascular grafting may not be possible in every case. Standard surgery is still the best option for many. As a fairly new procedure, endografts do not yet have a long track record to compare to that of surgery. Chest infections: Particularly in smokers. Wound infection: Wounds sometimes become infected but bad infections are rare. Graft infection: Very rarely (about 1 in 500), the graft may become infected. 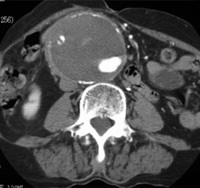 This is a serious complication, and usually the graft has to be removed. Bowel problems: Occasionally the bowel is slow to start working again after the operation. This requires patience and fluids will be provided in a drip until the bowels get back to work. Sexual activity (Impotence): This may occur in men as some nerves being unavoidably cut during the operation. This occurs in about 10% of patients. There is a risk of having complication such as a heart attack, stroke, kidney failure, loss of circulation in the legs or bowel, or infection in the artificial artery. Each of these is rare, but overall it does mean that fatal complication is about 5%. In other words 95 in every 100 patients will make a full recovery from the operation. Risk of operation for those with serious medical problems is higher. Surgeon should only recommend intervention tor aneurysm if the risk of the aneurysm bursting is much higher than the threat posed by the procedure. After the operation, most patients will return to a normal life.